Friday Night (11-16-12) CFDA Range Officer Course! We are hosting a CFDA Range Officer Course on Friday Night (Nov. 16th) t in the Bat Barn. Regulator in Training “Chisum”, will be instructing the course. The course is from 6:30 p.m. to 8:30 p.m., with follow-up training during the Turkey Shoot the following day. Cost: $5.00 (For New Students); Free refresher course to those already certified. 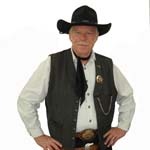 Prerequisite: Download the CFDA RO Course from www.cowboyfastdraw.com, it is part of your training on how to use the website for information and updates. If you do not have internet access or do not bring a copy of the course, there is a $10 charge to cover printing costs. You must call CFDA Office at 775-575-1802 in advance and arrange for a copy to be supplied. All those qualifying for the Overall Shoot-off will win a Trophy & Prize, plus due to popular demand, the Turkey Bonus Targets Are Back!!! This Year the B.O.D. decided on $20 certificates at WalMart for prizes, so winners could pick their own turkey or whatever else they like. One certificate per winner. Plenty of Fun and Lots of Shooting! Shooters will provide their own Shotgun Primer Loads per CFDA Rules.